A mix of 4 different reproduction Elizabeth I coins, including a Sixpence, Testern, Quarter Angel, and Crown. Coins are not pictured in relative size to one another. 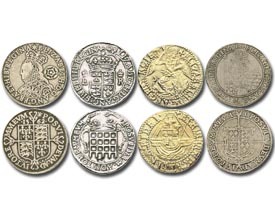 Sizes on these coins vary according to the historical size of the coin. Each coin has been enlarged in the photo to show detail. Pewter and gold-plated pewter. Made in the United Kingdom.